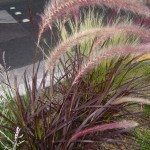 What is the best way to trim purple fountain grass? I live in Brisbane, QLD, Australia where we have hot summers and very mild winters. We are just coming into summer and the grass has grown very straggly and untidy looking. My husband wants to cut it off near the base with the hedge trimmer. 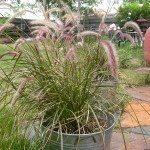 Hedge trimmers will work to trim back the fountain grass.